It was some eight years ago, and they were only the opening act at a barely advertised club evening in the far corner of a bar long since defunct. Yet I still remember Embassy Of Silence‘s first gig, because I was utterly impressed with their frontwoman. What’s more, the charismatic voice of Ines Lukkanen was perfectly matched by the band’s unorthodox song material, which was presented in all its adventurous glory on the outstanding debut album a year or two later. Each song on Euphorialight was like a little movie unto its own, challenging in terms of lyrics as well as of unexpected musical turns. 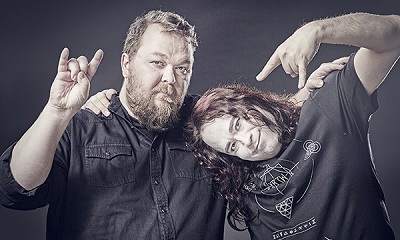 In line with EOS’s cinematic approach, Lukkanen posed on the cover of Finland’s leading metal magazine in an eye-catching remake of the famous Pulp Fiction poster by the time of the sophomore album, but that release itself did not quite reach the same heights as the first. 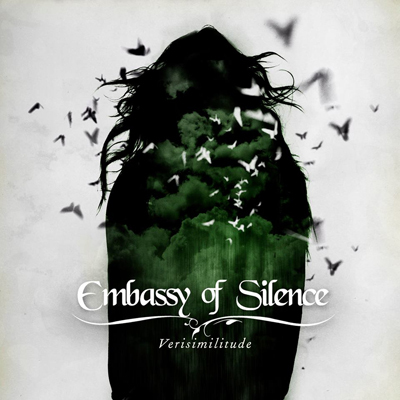 Now Embassy Of Silence are back with Verisimilitude, and in all honesty, its opening bars made me go WTF. Yeah, sure, I respect and appreciate Abba for all they were, but they are not what I would put on an Embassy album for. Points for the band’s daring sense of humor, but as a song, “Shame, Spin & Click” doesn’t do much for me. “Thimble” makes up for it by bringing back the mystic beauty I’ve always associated with this band, especially in the slow parts. “Absurdoscope” is downright great, the only problem is the studio joke at its end. Slightly annoying at first listening and increasingly so with each spin, it rather brutally interrupts the flow between two of the best songs on Verisimilitude. I ended up editing it out and my enjoyment of the album immediately increased, yet I feel guilty for tampering with the band’s artistic vision, not to mention that I’d much rather listen to the actual record than to files on my PC. But back to the music – “Moths” has a fine guitar solo but otherwise sounds far too much like an eighties pop tune for my liking. “Hang Me High” again is much closer to the “classic” EOB style, and the last two songs fortunately continue in that vein, securing a positive overall impression. A bit too slick in my ears, though. Verisimilitude is a decent successor to Antler Velvet, but I’m still waiting for the Embassy album that fulfils the expectations raised by Euphorialight. Rather than smoothing their edges as they have done for the last couple of albums, I’d love to see them take a bolder direction next time. This band if any should write the soundtrack to an imaginary steampunk movie, and I wouldn’t altogether be surprised if its storyline already existed in some corner of Lukkanen’s and Kalliomäki’s imagination.